"There was a national consensus before September 11th that cruelty would never be applied against American detainees, whether they be military or civilian. Yet several years later that consensus has been shattered. Almost half of the American people believe that the application of even torture is permissible, or should be permissible if it could make us safer. Thats a very dangerous set of beliefs." Alberto Mora was appointed general counsel for the United States Navy in 2001. One of Mora's great uncles had been imprisoned in a Nazi concentration camp; another was tortured before he was hanged. In December 2002, when allegations of harsh interrogations at Guantanamo were reported to him, Mora set out to correct the policy that he initially assumed was simply a "lawyer's mistake." After he was shown what he refers to as "the package" - a collection of secret government documents tracing the development of coercive interrogations, including the "action memo" written by Pentagon general counsel Jim Haynes - he took his concerns directly to Haynes. By January 15th, he told Haynes he would expose the Administration's policies if the techniques that Mora called "at a minimum cruel and unusual treatment and, at worst, torture" were not suspended. Though Secretary Rumsfeld did temporarily rescind the harshest tactics, Mora would be cut out of the later decision-making. He retired from the Navy in 2006, and in May of that year was honored with the John F. Kennedy Profile in Courage Award for "his moral courage and his commitment to upholding American values." In May of 2006, when you received the RFK award, you said, "It's astonishing to me still that I should be here today addressing the issue of American cruelty, or that anyone would ever have to." Yet, here you and I are more than a year later addressing the issue of American cruelty. It's still astonishing. And it's still unresolved, meaning that -- well meaning several things. There was a national consensus before September 11th that cruelty would never be applied against American detainees, whether they be military or civilian. And yet several years later that consensus has been shattered. And almost half of the American people believe that the application of even torture is permissible, or should be permissible if it could make us safer. That's a very dangerous set of beliefs. We're seeing it play out now in the Presidential elections where most of the Republican candidates seem to believe that the current administration's policies on detainees are acceptable, even necessary. And you see even softness on this issue among the Democratic candidates. So the national consensus on cruelty has been broken. And if there are further terrorist attacks, as there very well might be, then you'll see again the repetition of the call for the application of cruelty and even torture on detainees. And that would be disastrous for our country. Because it shatters the very foundation of our Constitution and the values upon which our Constitution were based. These values rest on the belief that human dignity is paramount. And if now it is the state that can decide whether or not cruelties should be applied, as opposed to the individual having a right not to be treated with cruelty, then there is enormous erosion of our individual rights and the philosophy of those rights, which essentially makes the individual subject to the dictates of the state. And the repercussions internationally would be the same, because it then shatters the foundation upon which so much of international human rights law has been based. And if we go back to the condition in which a state is free to apply cruelty, then we take an immense step backwards in human rights internationally. I read the comment of one observer who said that torture was a "talisman of power," that if a government could get away with torture, it can get away with anything. If the individual doesn't have the right to be free from torture and to enforce those rights, to some sort of judicial process, then individual rights cease to have significant meaning. The notion of rights become trivialized because if the right to be free from cruelty is not a right, then what else is left? Property rights, some types of free speech rights, these are important, but nothing is as important as the preservation of human dignity through freedom from cruelty. You said to me that we're just one attack away from this being just an academic exercise. What do you mean by that? I was listening to a debate just the other day including Democratic Congresswoman Jane Harman, who is a very liberal Democratic member of Congress. And she was asked a question about the administration's interrogation policies. Her response was that she opposed these kinds of techniques, but she felt that they should be outlawed except in some situations in which the President comes forward and requests specific authority to apply cruelty to an individual. And for a member of Congress who otherwise understands the issue clearly, to take the position now, that perhaps something akin to a torture warrant may be a way to continue to carve out the ability to apply these techniques against individuals, is an indicator of how far the national debate has been taken, and how close the American people are to achieving a consensus majority view that application of cruelty and torture is acceptable and even necessary. And again, if we come to believe that, even in very circumscribed narrow situations, it is because we have stopped believing that the right to be free from cruelty is an intrinsic human right. And that's a seismic shift in our set of beliefs about this issue. Let's go through a little step-by-step of the development of this "policy of cruelty," as you put it. In February of 2002, the President decided to opt out of the Geneva Conventions in Afghanistan and the war on terror. Were you and the other military lawyers, the Judge Advocate Generals, consulted about the decision about Geneva, consulted about setting up the military commissions, all of those policy decisions that were being made during that period? Largely we were not, as institutions. For example, the Department of the Navy General Counsel, nor the Judge Advocate General of the Navy or the Marine Corps, were not consulted expressly on these kinds of issues. And it's not necessary that they should have been. We were not in the chain of command such that the President or the Department of Defense General Counsel had to come to us as a matter of procedure within their department to seek our views on the subject. And specific JAGs actually were, on the margins, involved, because individual JAGs were attached to the staff of the general counsel to the Department of Defense. And they may have been engaged, or were engaged, in aspects of this matter. But no we were not consulted initially. Even though one would think that you're the repository of a lot of expertise. And of American servicemen who may be captured, but there are other instrumental Navy Judge Advocate General Corps and Marine Corps staff Judge Advocates -- these are more than 3,000 military lawyers who've been trained, all of them, in the Geneva Conventions, who institutionally understand what it means for a combat service, like the Navy and Marine Corps, to adhere to the Geneva Conventions. And of course there are various dimensions to this. One is the protection aspects of the Geneva Convention. One subscribes to the Geneva Convention because it makes enemy soldiers more likely to not resist capture than to resist capture. If an enemy soldier knows he'll be treated humanely if he's captured, he's not likely to fight to the last bullet. On the other hand, if an enemy soldier understands he's likely to be abused, then that increases his likelihood that he'll continue to fight and that American soldiers will be hurt or killed as a result. So there are a variety of factors that underlie the Geneva Convention and there's a large body of scholarship, all of which it is the principle domain of the JAGs to understand. In December of 2002 the head of the Navy Criminal Investigative Service came to you. Dave Brant -- who reported to me in the Navy because I was what's called the Reporting Senior for NCIS -- late on the afternoon of the 17th of December, Dave came to me and without prior warning or announcement said that his people down in Guantanamo, NCIS agents attached to the base and to interrogation activities down there, had reported to him that detainees were being abused. And he felt that the abuse was serious, that it most probably violated American law and certainly violated American values, that his men were upset at being associated with this, and did I want to know more. And I responded to him that I felt I had to know more. And when he heard that he says, "Well, I'll schedule a fuller briefing for you tomorrow." And so he did. We met again the following day at greater length and in greater detail on the issue. He didn't know what to expect when he came to report this to you? The subtext of David's question, "Do you want to hear more?" was something akin to, "Or is this too hot for you? Would you prefer not to be associated with any discussion, much less an inquiry into this issue?" Dave and I had been working with each other for a year and had a good relationship, but we didn't really know each other. We had not really been tested, either one of us, vis-à-vis the other, in a difficult issue. And Dave, I think understandably, didn't quite know what to expect. That took a lot of courage for him to bring it to you? It took a lot of courage for them, NCIS, Dave and his subordinates straight down the chain of command all the way down to Guantanamo, to recognize that abuse of prisoners could not be countenanced by American officials, and that they would not be party to such activities. This was the decision they made very early on and they were completely consistent during this entire episode. And it took courage to come to that opinion, particularly after 9/11 and particularly given the mood in the country and particularly given the fact that, as events would prove, this kind of treatment had been ordered by higher authority. What did you think when you heard it? I thought, first of all, the abuse of anybody in captivity, certainly within military ranks, or elsewhere, is presumptively illegal. When I heard this, my first thought was that these were rogue elements, that this essentially is activity of undisciplined, unsupervised individuals who almost certainly had escaped some sort of discipline. I thought it was surely a mistake, that it had its origins in discipline, rather than a conscious, deliberate effort. I also felt that it would be -- that the mere allegation that there was abuse of prisoners was explosive on its face. I felt the American people would not tolerate that for an instant, and so the possibility of this continuing, becoming known, could create great political damage to everything: to the military services, to our efforts in Guantanamo, to the Secretary of Defense, to our President and to our country in the larger war on terror. This was simply an explosive, damaging set of facts that had to be understood, had to be controlled, had to be eliminated as quickly as possible. When did you get the first hint that it wasn't necessarily just some rogue elements? Well, Dave suggested that that was the case in our first meeting. He had stated that they had heard in Guantanamo that what was going on there had been approved at the highest levels, but they had no information on this. This was a rumor in Guantanamo. They had seen no documents. They had not verified it in conversation with anyone, but it was something being spoken of in the Guantanamo context. When Dave and Dr. Mike Gelles came by the following day, they showed me transcripts of interrogation logs that made it clear that abusive, degrading, cruel treatment, and possibly more. Because these were only fragments, I did not know and they did not know what the full extent of the abuse was. That there was abuse, that was established through what they had indicated to me in the deposition or the interrogation transcripts, but if there was more, we weren't aware of that. The following day, the 19th of December, I then spoke to my friend and colleague, the Army General Counsel, asked him if there had been -- if he had any knowledge of abusive treatment, and that I had heard that there was some abuse of detainees going on in Guantanamo. He said that he did know something about this and asked me to come to his office. He then presented me with a document package. The earliest document in the document stack was a request from Major-General Dunlavey down in Guantanamo for authority to apply "coercive counter resistance interrogation techniques," as they're called. That document went up chain of command through SOUTHCOM to the Joint Staff. 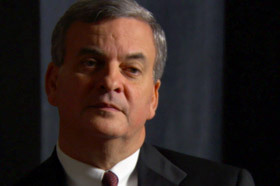 And the very top document was a memorandum from Department of Defense General Counsel Jim Haynes to Secretary Rumsfeld asking for authority and recommending that authority be given for the application of these coercive interrogation techniques. The document indicated that Secretary Rumsfeld also had given his approval to the use of most of those techniques. That was the first confirmation that I had seen on, December 19th that, in fact, there had been authority given at the highest levels of the Pentagon for the application of these techniques. I was -- I was horrified. I was dumbfounded. I was concerned. I was stupefied. I was astonished that this could have taken place, that Secretary Rumsfeld himself would have been asked, much less gotten involved in these kinds of matters. And as I reviewed the documents back in my office after first receiving them, and I looked through them, I saw that the legal memorandum that originated in Guantanamo was wholly inadequate and, as I felt instantaneously, an incompetent piece of legal work to justify that kind of conclusion. And I felt that all of it was some horrific mistake, meaning that -- and I felt this for a number of weeks -- that clearly both the DOD General Counsel and the Secretary of Defense had made a mistake. They did not understand the legalities of these kinds of actions, they had not thought through the legal issue sufficiently, had not thought through the political issues sufficiently, had not thought through the ethical issues sufficiently, and they just missed it. In the heat of the moment, in the concern that there were other 9/11-type attacks impending, out of their desire to protect Americans, they had acted uncautiously, without full understanding of what these decisions implied, and had made a mistake. That was my initial view, but that these documents were potentially disastrous, could lead to disastrous conduct, it was unmistakable from first glance. You thought you could fix it? I thought I could fix it. All of this happened quickly, within three days -- from the first day I heard about the suspicion, by the third day I'd gotten a copy of the documents, and the fourth day, December 20th, I asked to see Jim Haynes, DOD General Counsel, and I spoke to him about this matter. We had a conversation. I did most of the talking for about an hour. I pointed out to him that a variety of things, but that this was unlawful behavior, that if you looked at the documents, the documents were completely unbounded. Nowhere in the documents was there any limitation such that interrogation techniques could be applied, but only until the point where they reach the level of cruel, inhuman, and degrading treatment, much less torture, and that the fact that there was no such limitation in the memos could lead to the application, not only of cruelty, but of torture, either through the application of the individual interrogation techniques or in combination, surely. And after the meeting, I was convinced that before the door had swung closed behind me that Jim would be on the phone to the Secretary asking for the rescission of those techniques. You went through a litany with him of different kinds of techniques. I told him, "Jim, this could be torture." And he instantaneously responded, "No it's not." And I said, "Think through a little bit more carefully as to each of these techniques." Light and auditory stimulus deprivation -- what does that mean? You put them in a completely dark room for an hour, a day, a week, a month, until the person goes blind. Auditory deprivation, sound deprivation -- soundproof room, again, an hour, a week, a month, until he goes deaf, until madness sets in. The combination of both. Detainee-specific phobia techniques. What is that? The rats, the bats, the snake, a coffin. When and how? Clearly, clearly, either individual or in combination, these could very quickly lead to torture. Jim was silent as I mentioned this, but listened very closely, allowed me all the time I wanted to develop the arguments. And when I left I was convinced that he would be picking up the phone, calling the Secretary, and saying, "Boss, I made a mistake, we need to reel back something that we need to think through a little more carefully." I was absolutely convinced that that would be the reaction after that meeting. I left the following day for Christmas vacation. Was down in Miami with my family and my mother and thought that certainly things were going to be okay. But then even when I was down there on vacation, I received calls from NCIS that the abuse was still continuing, or so they had heard, in Guantanamo. And it was clear to me, as a result of that phone call that, first of all it had not been corrected; my visit hadn't produced the results that I thought it would produce. And second that if that was the case, it's most likely because the initial adoption of the documents, the authorization of those counter resistance techniques, had not been a mistake. Or at least, it was still a mistake, but it had not been inadvertent. People knew what they were doing when they authorized those techniques. I asked my Navy JAG colleagues, Admiral Lohr and his team, to start doing much more in-depth research on the legal issues associated with those kind of techniques. And in fact, the Navy JAGs prepared a legal memorandum establishing why this could not be authorized and why this was unlawful. But it was clear to me that as a matter of Pentagon dynamics, as a matter of bureaucratic dynamics, that this was a different kind of problem. It wasn't now just simply a problem of pointing out a mistake, which is easily enough done, but it was a problem of building a constituency to counter that policy decision. There were some in the Pentagon who obviously believed that this was lawful and necessary to do -- the application of cruelty to detainees. I had to develop a constituency who believed that it was unlawful and politically unwise to adopt that view. So I started trying to gather that coalition, that constituency. You mentioned briefly Mike Gelles. When he briefed you, what were his concerns? Mike, I had known because he was chief psychologist for NCIS and was deeply engaged across the panoply of these issues for the agency and was regarded as a treasure for NCIS. When Mike came in, he started discussing what was happening in Guantanamo, and his fears. He felt that the interrogation operation in Guantanamo was highly unprofessional to begin with, in the sense that the individuals who were applying or conducting the interrogation were almost entirely, possibly even entirely, very young individuals with no experience at all in interrogations. Most of these were young Army military intelligence or military police individuals who never really conducted an interrogation ever in their professional lives. Not only did they have no experience, they had very little training. After all, the United States had really not been involved in interrogation practices or actions for probably 30 or 40 years. So this expertise had been lost. Now, Mike Gelles, as being attached to a federal law enforcement agency, as NCIS is, comes from an entirely different background. If you're a federal law enforcement agent or if you're a police officer, the one thing you know is how to ask questions of suspects, because you do that every single day. If you're a traffic cop, you ask questions when you stop somebody, and you develop the feel and the expertise that comes from understanding human behavior and human response to that situation. So the average police officer, the average FBI agent, is much more experienced in interrogations and how to go about it successfully, than the average soldier is who has never done this. So these federal law enforcement agents in Guantanamo were talking to their counterparts and they were struck and appalled by the inexperience and clumsiness of what they heard was being attempted. Now there was that, then there was the element of force and coercion. They had heard about the use of force and coercion to try to solicit answers. And Mike Gelles was concerned about the phenomenon knows as "force drift," which is understood in the psychological literature. "Force drift" is a situation that occurs where an interrogator is authorized to use force, but then becomes frustrated because he's not getting the answers that he expects to get. In that kind of context, unless the interrogator is very closely monitored and restrained, then the phenomenon is that the force levels will continue to increase, meaning that if certain amount of force is good, then twice as much force is twice as good because it's twice as likely to produce the information desired. And if unchecked, the levels of force continue to be increased until you reach levels of torture. Mike Gelles felt that that phenomenon might have been occurring in Guantanamo, or would occur shortly unless stopped. When you saw the package of documents, you also saw Secretary Rumsfeld's signature, which shocked you, but you saw a handwritten note as well. At the very bottom of the top page, Secretary Rumsfeld, in his handwriting, notes in reference to the request for authority to apply stress positions in standing for periods of time, something like, "Why are they limited to four hours a day? I stand at my desk from eight to ten hours a day." And that, to me, as a litigator, is the kind of thing you don't want to see on this kind of document, for a number of reasons. I thought it was attempted to be as a joke. But it would not be interpreted as that by anybody who's going to be looking at this package. It would be seen, possibly, as a wink and a nod to interrogators to blow by these mild restraints and to apply more coercion to the detainees. In implication, the Secretary of Defense found these restraints to be too limiting, that in fact that one could have gone further in the application of coercive techniques to these detainees. In any event, I felt it was unwise and subject to misinterpretation, that particular comment, and another reason why those documents should be recalled and rescinded. Did you mention that to Jim Haynes, as well? I did. I did mention that. I felt that as a way to impress on him the seriousness of this, I felt attempting to dramatize would be an event years from the date, that the Secretary would be called to the witness stand to answer for his authorities and the consequences of those authorities. And, that the last question asked of him would be to point to the actual handwritten notation, he'd be asked to recognize and acknowledge his own handwriting and then acknowledge or not whether or not that was the wink and the nod to the interrogators to violate their restraints. So by attempting to place the Secretary of Defense in an imaginary witness stand, I sought to impress on Jim Haynes the consequence of that notation, the consequence of the documents by extension. It is a pretty shocking notation, when you see it for the first time. It's unwise. I'm convinced it was an attempt at humor, but in that kind of context, humor or irony is simply not appropriate and will be misinterpreted. Let's move back down to January. You come back, you've been told, I guess, several times now, that nothing seems to have changed at Guantanamo. I went back to see Jim and I went back to see many other people in the Pentagon, most of them -- the others -- for the first time. The next time I met with Jim it was for about another hour conversation. I did most, or almost all of the talking this time. I pointed to Jim, in a much more structured fashion, all the things that were wrong with the authorities. And I spent a good bit of time dwelling on the European consequences of that authority. The interrogation techniques that had been authorized were almost identical to those which had been applied by the British government against IRA terrorists or suspected terrorists back in the seventies and eighties. And these techniques had been found by the European Commission of Human Rights to constitute torture, and have been found by the European Court of Human Rights to constitute cruel, inhuman, and degrading treatment. Both of these kinds of treatments are prohibited as a matter of law in Europe and regarded as criminal violations. The British government understood the importance of this. The Prime Minister at the time was compelled to go before the Parliament, admit the use of these techniques and then promise never, ever to engage in them again. Then later the court of human rights came down with its decision. My point to Jim, among really a lot of other points, was that -- what would this do, the authorization of these, the application of cruelty to detainees, to our alliance in the war on terror? We had few enough allies as it was. Tony Blair was about to stand for re-election. If it became known that the United States had authorized detainee treatment techniques that were crimes, as they are under British and European law, how would that affect the coalition? How would that affect Tony Blair's political chances? Would it make it less likely, or more likely that they could continue to cooperate with us on the war on terror? For me, the answers to those questions are really blindingly clear. These actions promised to, actually threatened the existence of our coalition and our efforts to draw more allies to us in the war on terror. So it wasn't a question of just how to treat a detainee in Guantanamo, although that was serious enough and sufficient enough as a level of analysis, but this had strategic consequences, because it would weaken the coalition. And we had to broaden our focus to understand the full dimensions of these decisions, including the foreign policy and military policy consequences of these kinds of actions. Also among the series of issues that I raised with him, was the fact that if we were to apply cruelty now, it would necessarily imply a repeal and repudiation of our historic commitment to human rights as a foreign policy objective. Ever since World War II and arguably before then, the nation has been aggressively promoting human rights very successfully, successfully in the sense that it's altered other nations' and other individuals' behavior around the world. And all of this has been to the benefit of the United States and our long-term national security interests. And if we were now to allow the use of cruelty as a national policy, that was to say that other countries could also apply cruelty as a matter of their policy. It would repudiate all of the major human rights conventions that have been largely the result of American advocacy since World War II. How could we do that? And if one balanced the ability to interrogate harshly some detainees against the repudiation of our human rights policies, wasn't it very clear that the larger national interest lay in continuing to expound human rights as a central element of our foreign policy? These were among the issues that I raised with Jim in that meeting. And at some point you urged him to protect his client. I asked him to protect his client. Towards the end of the meeting, Jim was listening, but really not reacting to anything I said. I didn't know if I was getting through to him or not. And one of the consequences of this, I felt, was that Secretary Rumsfeld, individually, was at risk. And for one lawyer to urge another lawyer to protect a client is one of the strongest messages that a lawyer can possibly send. And I was hoping that that would get through to Jim if the other arguments did not, and cause him to reexamine these authorities and the legal underpinnings for these authorities. Did you have any idea if that argument was getting through to him? I didn't have an idea. Jim is a very private individual. He has a habit of listening very intently, but rarely saying anything at all. So it's very difficult to understand what Jim is thinking. And to this day I couldn't tell you really what Jim's positions and views are on these issues. I can extrapolate from events, but I can't tell you as a product of his comments to me. That simply hasn't happened. But at the end of the meeting I was increasingly frustrated because I really had no indication one way or the other which way Jim was leaning and whether my arguments had made any impact at all on him. So what prompted you to write a memo and tell him you were going to sign it out? Well what happened -- I was making my case to the other General Counsels in the department, the other T-JAGs. I had also spoken to individuals who were close to Secretary Rumsfeld as part of his internal staff, making the same kind of arguments. Admiral Lohr and General Sandkuhler had spoken to our military chain of command, meaning they had gone to the Vice Chief of Naval Operations, Admiral Fallon, who is now CENTCOM commander, and others. Admiral Lohr and I spoke to other Navy admirals on these kinds of issues. So we were seeking to develop a consensus within the Pentagon that, in fact, this was wrong policy and bad law. But events weren't moving as rapidly as I desired. I had now been advocating this for over two weeks, close to three weeks. The reports were that the abuse was still continuing, and I felt that it was time to put something in writing and escalate the formality with which I was registering my concerns. And that's what prompted me to write the memorandum. I wrote a draft memo to Jim. And essentially it analyzed the memorandum from Guantanamo that requested authorities for the application for these "counter resistance techniques," as they were called. And I indicated that this request requests, and if authorized, would result in the application, potentially, of torture to individuals in Guantanamo, indicated that the memorandum was completely unbounded, and that the application of the techniques, individually or in combination, could certainly rise to the level of torture. I indicated that to authorize torture would be unlawful, contrary to American values. It would be profoundly damaging of our interests either legally, militarily, diplomatically. It would also have internal and external political consequences that were unfathomable, but certainly be severe. And that was the fundamental memorandum. Well, I delivered that, the memorandum, as a courtesy to him in draft on the morning of, I think, the 13th or the 15th, I forget now which day it was. And then we arranged to meet that afternoon. Jim pushed the memorandum back at me in its envelope and said, "I don't know what you're trying to accomplish with this," which was an astonishing comment. But he instantly followed that up by saying, "Surely you must know what impact your words have had on me." And I responded, "You know Jim, you're a pretty private guy. I have no idea what impact words have had." Actually he started laughing when he said that, he said, "Yeah, I guess I'm pretty quiet." He said, "Look" -- I said, "For all I know, you've thought that every word I've said is the gospel truth. On the other hand, you might think that what I've said was of no value at all, or something in between, but I have no sense of where you stand on these issues." And then he said, "Well, I'm happy to inform you that the Secretary is considering rescinding his authorities." And I was a little bit taken aback by that. It was good news, but what does it mean to consider the rescission of the authority? So I said, "Considering?" And then he said, "I know, I know. Let me get back to you." He must have felt that I was saying that that was not good enough, and in fact I hadn't really formulated a response to that. So I went back to my office and a couple hours later Jim called me to say that the Secretary had, in fact, rescinded the techniques. And I thought it was a happy day. I thought it was just again, it took longer than I would have wished, but fundamentally the Secretary and the Pentagon had re-examined the policies and had come to the right conclusion, meaning that, "Not something we want to do or really can do." So that afternoon was a happy afternoon. But you couldn't talk about it? Oh, no, no, of course not. No, this is -- and really throughout this entire period, I tried to keep the circle as narrow as I felt was required in order to reverse the policy. Initially it was just Jim Haynes. I mean, we talked about it internally within my senior leadership circle within Navy law. I had a brief conversation with Secretary England about it. I had a brief conversation with Under Secretary Livingston, but I felt fundamentally this was a lawyer's mistake. We lawyers in the administration had allowed this to happen. It was up to us, the lawyers, in the Pentagon to correct this. And that was the initial impulse on my part. You couldn't tell your wife? I didn't tell my wife. No, of course not. My wife would not know about any of this until more than two years later. In fact, what happened was that we were at another Christmas party two years later. And the Deputy Army General Counsel, as he was coming up to our receiving line -- this was Navy's party, and he was coming up with his wife to the party -- joked to the two of us that -- this was after Abu Ghraib -- that I was the one who had fought against torture. And my wife looked at me and went -- said, "What's he talking about?" And then the Deputy General Counsel then started explaining it, but that was the first time my wife had ever heard about any kind of involvement whatsoever in these issues. At the same time that the Secretary rescinds the authorities, he also sets up a so-called "Working Group" on detainee and interrogation policies. Right. The very next day, in fact it may have been the same day, coupled with the rescission, the Secretary, as I understand it, ordered Jim Haynes to set up an inter-service Working Group to analyze, in greater depth, these issues, how to conduct interrogations. What are the permitted boundaries of interrogation techniques? So starting on the 16th or 17th of January, Jim Haynes asked the Air Force General Counsel, Mary Walker, then, to be the head of this Working Group. And then a task force of lawyers, both civilian and military, from the various services was assembled to begin analyzing this issue. Very quickly the Working Group developed a rhythm and direction that, to me, and I think to the other JAGs as well, seemed to be pointing towards the repetition of the Guantanamo authorities, meaning that they would be reissued again, albeit under the cover and authority of the Working Group's process. There was a body of individuals within the Pentagon who very aggressively wanted to re-propagate the same aggressive interrogation techniques that the Guantanamo memos, the Diane Beaver legal memorandum had authorized. And very quickly after the initiation of the Working Group process, what happened was that the Office of Legal Counsel, Department of Justice was asked to come in and provide legal guidance to the Working Group. That, as you might know, is an important step within the federal government because the Office of Legal Counsel is legally the most senior body within the Justice Department, and has legal authority to rule what the law is for all federal purposes. So the Office of Legal Counsel writes an opinion saying that this is how the federal government shall interpret a particular statute. Then one is obliged to follow that interpretation. OLC was asked to come in and render an opinion on these matters. It's still classified, but in general, what was in that draft opinion? It's been much discussed, of course. This is an opinion in draft that was written by John Yoo, who was then the acting director of the Office of Legal Counsel. The draft document -- it was not finalized. It was not when I first saw it. In fact, all versions of the documents I saw were not finalized. They were always in draft form. It was delivered by OLC to the Air Force General Counsel, maintained by the General Counsel in her office safe, and for any of us who wanted to read it, we had to go to her office and under her supervision, then read the document. We were not authorized to take copies, nor to take notes of the contents of the document. It's a very strange way to handle this or any other issue. And it's the only time during my four and half years at the Pentagon that any document was treated with this kind of restraint or restriction. You feel like a schoolboy, because you're handed the document, then you sit down and then the monitor goes down to the other end of the room and is occasionally glancing at you as you read the document. So it was silly, really, for somebody at our level, with our security clearances, to be treated in this kind of fashion. But another factor was that you couldn't really analyze it in depth. You could try to retain a memory of certain of the points, but you couldn't then systematically take the document apart and analyze it, because you didn't have it to work with. So it impeded the serious consideration of its arguments or its flaws. And that was one of the problems with the process with this document. But I read the document and the document, to me, was -- well first of all, it's like all OLC documents. These are very densely argued and almost all of the OLC documents are models of legal logic and draftsmanship. They're very carefully, closely reasoned. And they evidence a high degree of legal skill applied to the problem. But this document was awful. There's no other way to describe it. And it caused, with me, a certain dissonance, because you're used to seeing documents that are so carefully crafted that the correctness is evidenced from the quality of a legal analysis. This document was the opposite of that. The first thing I did when I looked at the document was look for the words of limitation. I mentioned to you that the first thing I did with the Guantanamo documents was to look for the boundaries that were established for interrogation. So I looked at the document for the boundaries and there were no words of boundary there. The document did recite that torture was prohibited. But I wasn't looking for torture as being the standard; I was looking for cruel, inhuman, and degrading treatment, and that prohibition was nowhere in the document. When I looked at the document more closely and read the presidential authority section of it -- that was crude and wrong. Fundamentally, the argument made by the document was that the President, when exercising commander-in-chief authorities, had unlimited authorities in interrogation or anything else, and that any attempts to limit the President's authorities would be, per se, unconstitutional as a violation of the President's inherent commander-in-chief authorities under the Constitution. Well, that's wrong. It's just simply wrong. The Constitution is a checks and balances system. The history of commander-in-chief authorities also is replete with instances of congressional checks. The Congress has authority to govern the captures at land and sea. So the Congress is given constitutional authorities for detainee treatment expressly in the Constitution. And for the document not to mention that was profoundly mistaken. So when you look at this, you saw an argument that essentially could have been used to uphold the earlier decision that Secretary Rumsfeld had taken concerning the application of those techniques to the individuals. And that was a disastrously wrong piece of legal advice that could have disastrously wrong consequences because you could lead to the reaffirmation of the authorities given at Guantanamo. Mary Walker, the Air Force General Counsel, and I had a dispute. I advised her that I felt that the OLC memorandum written by John Yoo was simply flawed. It was a dangerous document. It could not be relied upon, should not be relied upon, that it should be dispensed with. She took a completely contrary view. She felt that the document was soundly reasoned, it was good law, and she also communicated that Jim Haynes also felt the same about the document. John Yoo had come over to the Department of Defense and spoken to several of the Working Group members. I had not been able to be present at that meeting, so I asked him to come by the Pentagon and to have a discussion with me about the document. And he did, he came by and we met in my office in the Pentagon. What was the gist of your discussion? John Yoo is a very charming, deeply learned individual. And he was explaining then in essence the conclusions and his reasoning in the memorandum and was coming to exactly the same kind of conclusions. And as he was talking I was becoming more concerned and more alarmed and ultimately I asked him the question, "Well John, does this mean that the President has the authority to order torture?" And he said, "Yes." And I said, "I don't think so." And I was starting to then develop that thought and he holds up his hand and he says, "Wait a second. I've just told you what the law is. Now what you're speaking about now is a matter of legal policy. Now it might be that it's the better legal policy not to permit this, but as a matter of law the President has authority to order this." And I looked at John and I asked him, "Well, John, where does one have this policy discussion?" And he kind of shrugged, looked around and he says, "I don't know. Here in the Pentagon? You guys are the experts on military law." And that was fundamentally the end of our conversation. So something that should have been a matter of national debate is being developed largely out of public view. These were not matters for us in a back room in the Pentagon to decide. The consequences of these decisions were far reaching and I felt -- always feel today that these are matters for the nation to discuss and decide upon. I won't name names, but there was a group of administration lawyers, Yoo is one of them, Vice President's office, et cetera. How would you rate their performance as attorneys? One theme that runs through these documents is essentially an argument of unlimited presidential authority. Another concern that runs through the memos and documents is a concern about how to avoid potential prosecution, for war crimes. There seems to have been an understanding that the application of cruelty to detainees may trigger the War Crimes Act, which of course makes it a criminal violation of the United States to violate Geneva Convention Common Article Three, in terms of treating individuals in US custody. The President had determined that Geneva did not apply to some or all of these prisoners, but nonetheless the attorneys were concerned and needed to examine a possible situation in which a court found that that was not sufficient. That, in fact, the War Crimes Act was applicable to this kind of behavior. And as we now know, that concern was well founded, because the Supreme Court in the Hamdan decision in 2006 did indicate that the Geneva Conventions, and Common Article Three specifically, did apply to individuals in detention. So consequently, the Supreme Court found at that time that the President's determination that it did not apply was contrary to the law. How did the Working Group process end? There are two answers to your question. There is what I felt, and had thought had happened at the time, and then what actually did happen. What I thought had happened, first. I thought that the process sputtered to an inconclusive halt, meaning that there would be no document or paper or report issued by the Working Group. The Working Group had been working on a lengthy study of interrogation techniques, both under law and under policy considerations. And the way it had been developing, the last draft I saw of the report suggested that the President had discretionary authority to order the application of cruelty towards detainees and to do so would be lawful and would be supportive of our foreign policy goals. This was the argument advanced by John Yoo's OLC memorandum. That was really the foundation of the entire Working Group report. Jim Haynes invited me to speak to him privately as to my thoughts and my evaluation of the Working Group work report. I told him that it was a bad piece of work. I thought it was unsubstantiated. I thought -- I said, "If I were you, I'd put this in a desk drawer. It'd never -- never let it see the light of day again. Just let it go away." My understanding was -- and I think that every other JAG -- these are the military uniformed lawyers, the two-star generals and admirals -- also gave him the same advice. And they believed this, also, independently. I proposed to write a lengthy objection to the entire document. I proposed, on behalf of the Navy, not to concur with the issuance of that Working Group report as I saw in that draft. But then I didn't hear anything more about it. The document was never put in final form, never circulated to us. And in fact, several months later, in discussions with the Navy Senior Judge Advocate General and the Marine Corps Senior Judge Advocate General, we'd be discussing what happened to the Working Group report -- we thought it had gone away, that essentially Jim Haynes had decided that no, he didn't want to promulgate that document, and he didn't need to do anything further on this. So once again, you thought you might have won? We thought we had won, meaning that the secretary had rescinded his authorization for coercive interrogation techniques in Guantanamo. The word from Guantanamo was that the abuse of prisoners had stopped. This is now in the spring and summer of 2003. And then, in that summer, Jim Haynes wrote a letter to Senator Pat Leahy, which became public, and the letter said that not only does the United States not apply torture, it does not cruel, inhuman, and degrading treatment to its detainees. This, I thought, was exactly where we had to be, and I was delighted to see Jim, on behalf of the Department of Defense, write that letter to the senator. I wrote Jim an email saying, "Delighted to see this; proud to be a member of your team." And that's where things stood, as far as I was concerned, until Abu Ghraib occurred, about a year and a half later. I thought that it had been an unfortunate debate. It had been a mistake, then a debate. The debate had not gone as smoothly as one might have wished, but it had yielded the necessary and welcome result. I mean, we had reverted to a policy of not applying cruel, inhuman, degrading treatment to detainees, and had publicly advised the Congress that, in fact, this was our policy. So I was -- I was delighted that we as an institution, the Department of Defense, had come to this conclusion at that time. But that's not what happened. That's what I thought had happened. What really happened was somewhat different. After Abu Ghraib occurred, and there were the numerous Congressional hearings, I was in my office at the Navy one day and was watching an Army general testify about Abu Ghraib to a Congressional panel, and he made a reference to having seen a Working Group study from the Pentagon. And I was puzzled. It could only mean one thing, that he had gotten a copy of the draft version of the Working Group study. So I picked up the phone and tried to call the Air Force General Counsel; she wasn't in. I spoke to the deputy, Dan Ramos, a good friend and very able attorney. I said, "Look, Dan, heads-up. I'm watching on television, as we speak, an Army general talk about having seen a copy of a Working Group study. I don't know how he might have gotten it." And he said, "Oh, didn't you know? The Air Force General Counsel and Jim Haynes signed out that memorandum, and briefed it out to General Miller in Guantanamo and General Hill," who was the SOUTHCOM commander at the time. Secretary Rumsfeld had approved that memorandum. So a version of the Working Group report -- and I've never seen that final version -- was signed out. And what I understand it provides is the ability to apply cruel treatment, apply cruel interrogation techniques to detainees, although under more controlled conditions than previously, meaning that in order to apply these techniques one has to seek the application -- or seek the permission of the Secretary of the Department of Defense to apply those techniques. So apparently that Working Group memorandum was approved and circulated, unbeknownst to either me or any of my uniform JAG colleagues. None of my colleagues, the senior military lawyers, have seen, or had seen, a copy of that final document, and did not know it had been promulgated. Well, certainly the Secretary has the authority to do that. The Secretary has the legal authority to issue documents and to take what advice he wants to take and discard that advice he doesn't want to take. So as a matter of authority, he's got it. As a matter of internal Pentagon activity, it's hard to comprehend. Once you've established a Working Group, you're seeking to achieve a consensus among the services, among the top lawyers of the services, as to what could be done, what should be done, in this kind of area. You think you'd stick with that process to the very end. So aborting the process, I think, leaves you open to the subsequent determination that you did not adopt the best and most considered judgment of the services' leading experts on the issue. That the process should have been circumvented and policies contrary to that advice be adopted was just a profound mistake. Much like I think it's mistaken, as a matter of procedure, not to seek to obtain the best advice available on any given subject and try to achieve consensus on what that might provide. There is a danger always in going to these things solo that you'll come to the wrong conclusion, and this is what might have happened here. How much do you think was being directed from the White House? I have no way of knowing that from personal knowledge. I know what the John Yoo participation was in terms of giving legal advice. And since that time, of course, there has been much more published and said about the role of the White House in these kinds of matters. There is now a considerable body of testimony and evidence to suggest that White House counsel, Gonzales, then Attorney General Gonzales, were deeply involved in these issues. The Vice President's counsel, Dave Addington was deeply engaged in these issues, but I -- it's not something that I know of as a matter of personal knowledge. You obviously are concerned. Are you angry, sad, as well? I guess I'm both of the above, but it's really more a matter of the country reaching the right decisions on these issues. It's not a matter of sad or anger as a continuing interest on my part, in continuation of the discussion, until we understand fully the ramifications and the consequences of these decisions. Not only looking back retrospectively at those events that happened in 2002 and 2003, understanding better Abu Ghraib, but perhaps now the large question is, what does this all mean to us going forward? Should we contemplate the application of cruelty or torture to terrorists in the war on terror? Could doing that make us safer? And my concern continues to be that the country understand that it really makes us weaker. It's harmful to us. It doesn't make us stronger. And for us as a nation to analyze this issue purely in the context of one detainee or some detainees and what happens in the interrogation booth, and not understand that there are much broader issues associated with this than the interrogation context, is an important discussion for our country to have. If we were to adopt a policy of cruelty, it would mean, as I mentioned, that the underlying premises of our Constitution and the values that underlie them are wrong, meaning that individual dignity is not inviolable, or inalienable. It is all subject to government determination and decision; that we as individuals don't have rights to personal dignity. That all of these rights can be violated if a nation, our nation or any other nation, considers it as important in the sense of national security. And if we're to make that kind of exception, it would be really -- to undermine and start to dismantle our Constitutional system, and it would be to dismantle the thrust of the foreign policy, which since World War II, has sought to build a rules-based system premised upon individual human dignity as the cornerstone of that system. And if we're to ask for exemptions for ourselves, it's to say that we're prepared to grant those exemptions to any other nation that calls for them. And for those other nations, it might not be terrorists who would be treated cruelly; it might be individuals who speak disparagingly of the Prime Minister, or the Prime Minister's family. Exactly. And once you say that this is not something that attaches to the individual, but it's a matter of individual government decision-making, discretion, and grace, then we're in no position to advocate a different set of values. And that would lead to the construction of a world that is very different from the kind of world that we would wish to see and for which we have fought since the end of World War II. So these are decisions that don't just deal with interrogations. They deal with the contours and content of the concept of human dignity. And because they affect that definition, these decisions have had profound significance. That's on the one hand. But on the other side, the practical side, I think it's important for Americans to understand that if we're to advocate a policy of cruelty, other nations will not follow us in that direction. And by other nations I mean the traditional allies who have -- whose support we need to have if we're to prevail in the war on terror. Europe is not going to go in this direction, nor is Canada, nor is Australia, nor is New Zealand, nor are other democratic countries, because it's a criminal act for them to engage in that policy. And they don't want to destroy their Constitutional orders in order to help the United States apply policies of cruelty. So we will not have the large coalitions that we need to have. We will not be able to build consensus and support for our policies, and these are -- if this were to happen, this will not make it easier for us to win the war on terror. It'll make it harder. So these decisions go against the grain of our strategic interests in the larger war. And it's important for Americans to understand that consequence if the motivation of America is to become safer long-term in the war on terror. Do you expect that we may, in the future, see war crimes prosecutions? I don't know that -- I would hate to see that happen. I tend to suspect that it won't happen in the United States, but I think -- in fact, I know that there are any number of prosecutors all over Europe who continue to gather evidence with the view that the United States and individual American officials may have committed war crimes in the war on terror. I think there is a likelihood that there will be attempted prosecutions, war crime prosecutions, initiated by foreign governments. It's a sobering thought, and just another indication of how these decisions harm us in a foreign policy and national security context. This isn't the first time in our history that, in a period of war, we have acted against our values. No, it's not. It seems to be a recurring theme. Whenever the United States is attacked or threatened, or felt to be threatened, then you see episodes of what we would now recognize as violation of our values. It happened during the Civil War, during the President Lincoln's suspension of habeas corpus. It's happened during World War I, in the persecution of Americans of German descent. And through World War I, then towards the end of the Cold War, in certain excesses in -- against individuals believed to be communists, or possible communists. Most notably, it happened during World War II, during the internment of Japanese and Japanese-Americans resident in our country. Over 130,000 Japanese-Americans, meaning Americans, were incarcerated by authorities. They lost their property; they lost their liberty during the war. And of course, that's now recognized to be a matter of national shame, that we should have done that. We -- we have a susceptibility to excess in times of national danger. And while, to some extent it's understandable, at least the cause is understandable, we have to be vigilant against repetition of these excesses. How do you think history will judge this period in terms of the policy of cruelty? My personal view would be that it will not judge us favorably. As a matter of law and national values, our adoption of official policy of cruelty will be seen as a departure from our values and our laws. As a matter of strategic wisdom -- did we do the things that we should have done to prosecute the war on terror effectively? It will conclude that these decisions harmed us in the war on terror, and that if promulgated and continued, would have very serious long-term consequences that are very much contrary to our national interest. That, I think, will be the judgment of history in this situation.